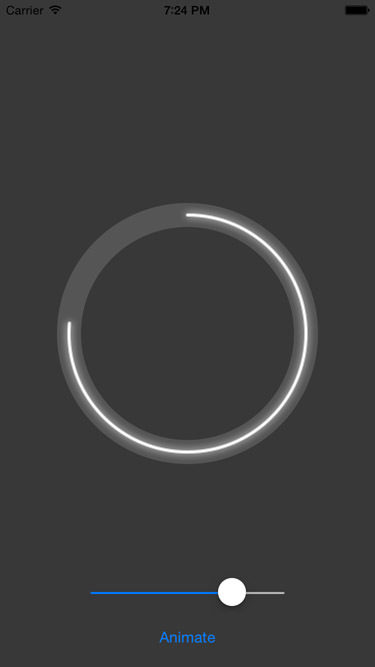 KDCircularProgress is a circular progress view written in Swift. 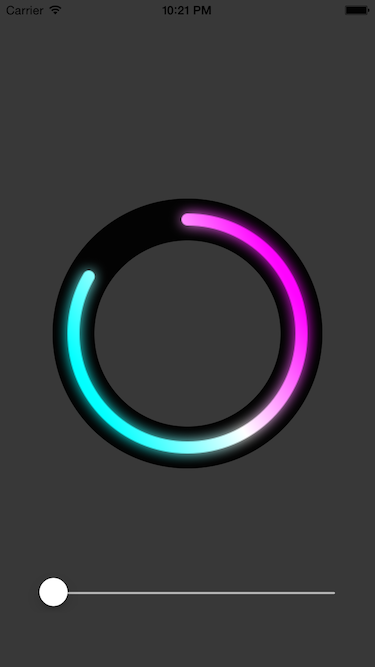 It makes it possible to have gradients in the progress view, along with glows and animations. KDCircularProgress also has IBInspectable and IBDesignable support, so you can configure and preview inside the Interface Builder. 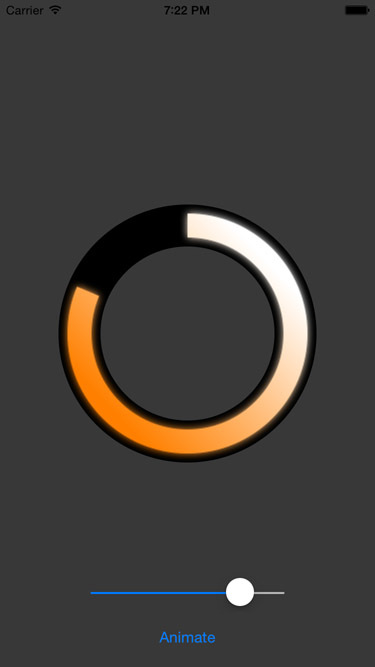 KDCircularProgress requires iOS 8+, although iOS 8 support hasn't been tested in a while. 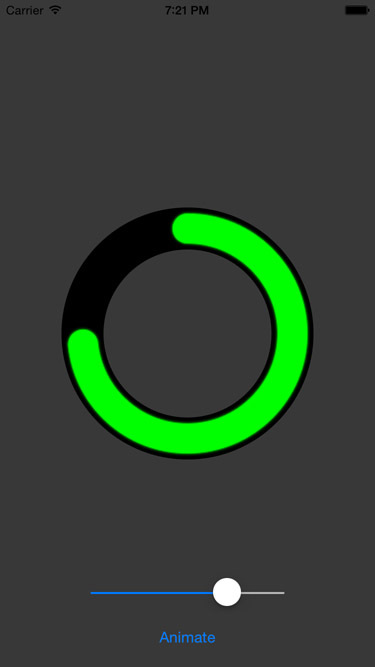 Just drag KDCircularProgress.swift into your project. Carthage support is on To-do list. 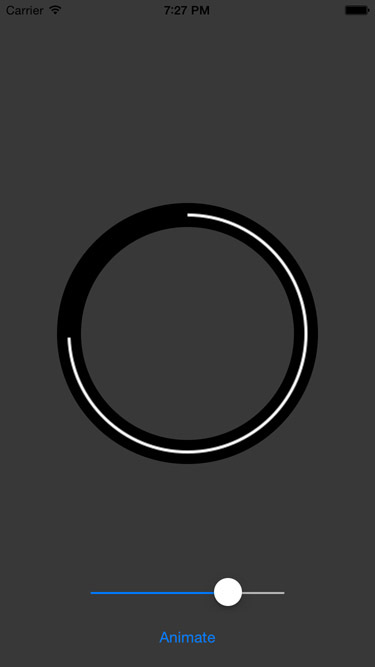 Just drag KDCircularProgress.swift into your project. Below you can see code that creates and sets up a KCircularProgress instance. Which gives you a configuration that looks similar to the progress in the example images. The colors used to generate the gradient of the progress. You can also set this using the variadic setColors(UIColor...) method. A gradient is used only if there is more than one color. A fill is used otherwise. The default is a white fill. The angle of the progress. Between 0 and 360 (inclusive). Simply change its value in order to change the visual progress of the component. Default is 0. The angle at which the progress will begin. Between 0 and 360 (inclusive), however you can pass any negative or positive values and the component will mod them automatically to the required range. Default is 0. Clockwise if true, Counter-clockwise if false. Default is true. When true, the ends of the progress track will be drawn with a half circle radius. Default is false. Describes how many times the underlying gradient will perform a 2π rotation for each full cycle of the progress. Integer values recommended. Default is 0. The intensity of the glow. Between 0 and 1.0. Default is 1.0. .forward - The glow increases proportionaly to the angle. No glow at 0 degrees and full glow at 360 degrees. .reverse - The glow increases inversely proportional to the angle. Full glow at 0 degrees and no glow at 360 degrees. The color of the background track. Default is UIColor.blackColor(). 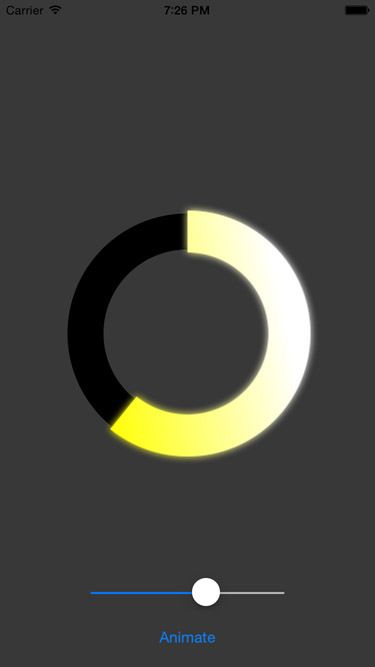 The color of the center of the circle. Default is UIColor.clearColor(). Initialize with a frame. Please only use square frames. Initialize with a frame and the gradient colors. 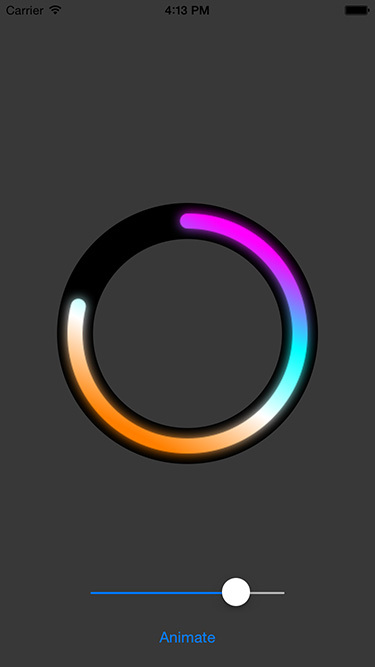 Set the colors for the progress gradient. Animate the progress from an initial value to a final value, with a completion block that fires after the animation is done. relativeDuration - specify if the duration is for the specific animation or is the duration that would make a full turn. Animate the progress from the current state to a target value. Pause the animation, if any. Check if there's an active animation. Prefering light colors in the gradients gives better results. As mentioned before, use square frames. Rectangular frames are not tested and might produce unexpected results. A touchbar concept for iOS keybaord accessory view.